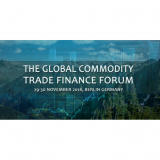 "Promoting Global Commodity trade Finance sectors"
We organize we learn how to provide you with the conference you expect and meet your interests. Throughout the two #forum days, we promise you professional and, that is very important, friendly environment aimed at discussions of challenges and issues industry facing, exchange of ideas and positive attitude to finding solutions, addressed and scrutinized from every angle. The Forum is limited to an amount of attendees in purpose you have time to discussion, debates, interaction, and networking. On our experience we decided to include not only presentations from the speakers, but more panel discussions, more time for questions and networking, so you can take away new contacts, and practical knowledge, be inspired into your work. The Weinmeister Berlin-Mitte - ..